How do the tiny progeny of seafloor animals disperse through the ocean? The marvelous migrations of fish and whales through the deep sea have been hard enough for us humans to follow. But what about tiny organisms—many smaller than the dot beneath this question mark? How they move from one spot to another in the depths has long remained beyond our grasp. The enigma deepened in 1977, when scientists discovered spectacular and strange communities of animals clustered near vents on the seafloor. These so-called hydrothermal vents spew chemical-rich fluids that sustain clams, mussels, tubeworms, snails, and other species. Like shellfish in shallow waters, most of these relatively sedentary deep-sea animals reproduce by releasing eggs and sperm into the water. These develop into tiny floating larvae—the aquatic animal equivalent of seeds—that disperse, settle at vent sites, and grow. Here’s the catch: The vents are distributed intermittently along mid-ocean ridges—the long volcanic mountain chains that bisect the seafloor throughout the globe. These vents “turn on” and “turn off,” fueled by the ebbs and flows of hot magma beneath the seafloor. So how do the larvae, tinier than specks of dust, maintain their populations in such a patchy, transient environment? How do they get transported from one active vent site to another that might be tens of miles or more away? These questions are keys to understanding how life has evolved on the seafloor and how it survives. Answering them requires a blend of biology, oceanographic physics, geology, and chemistry. 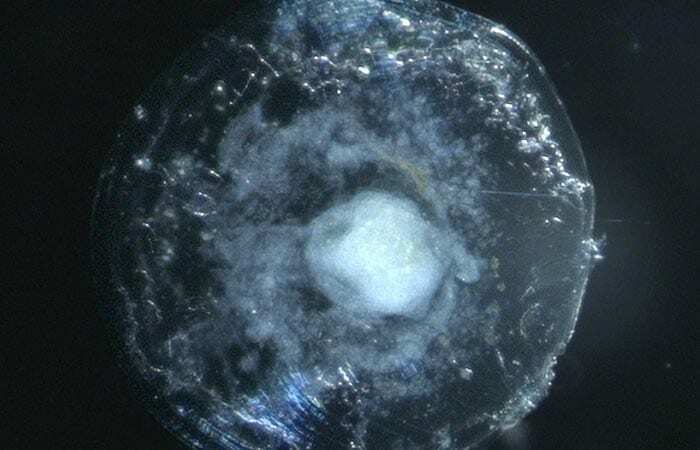 So in 2006, scientists from Woods Hole Oceanographic Institution (WHOI) led a collaboration of researchers from different disciplines who investigated the broad range of factors that could influence larval movement, focusing on one particular mid-ocean ridge called the East Pacific Rise. The research project, dubbed LADDER (LArval Dispersal on the Deep East pacific Rise), is prompting scientists to rethink much of what they suspected about how deep-sea larvae disperse. In the late 1990s, Mullineaux and colleagues from Pennsylvania State University and University of North Carolina launched a project that began to make inroads into the lives of larvae. They developed high-pressure systems to culture deep-sea larvae in the lab and study the larval stages and life cycles of several species. During multiple visits over a few years to vent sites on the East Pacific Rise, the scientists used the submersible Alvin to place and later retrieve experimental blocks of rock around seafloor vents to collect larvae and learn how they settle. The researchers discovered that the larvae of one tubeworm species contain enough stored energy, in the form of lipids, to survive for 30 to 40 days. Some larvae had hairlike cilia for swimming, but they wouldn’t take the tiny larvae very far. They needed to get swept into big ocean flows or currents. But what kind of flows and how far could they take the larvae? Then in 2006, an unanticipated event gave researchers a rare opportunity. A series of excursions with Alvin showed that seafloor eruptions over several months on the East Pacific Rise had wiped out well-studied vent communities of organisms at 9°50’ N, south of Mexico. Until then, it had been hard for scientists to distinguish whether oceanic flows were bringing in larvae to 9°50’ N from distant sites, or taking larvae from 9°50’ N to other distant sites, or preventing larvae from leaving 9°50’ N and forcing them to settle near their birthplace. Any of those were possible. New vents formed in the area, but the eruptions that paved over previous communities with lava presented the researchers with a clean slate and a chance to observe how larvae colonize an area from its beginning. Mullineaux jumped into action, teaming with Jim Ledwell and Dennis McGillicuddy from WHOI, Andreas Thurnherr from the Lamont-Doherty Earth Observatory at Columbia University, and Bill Lavelle from the National Oceanic and Atmospheric Administration. They set out on a series of cruises to capture as much information as possible about where new animals colonizing the clean-slate site came from and how they got there. Seafloor experiments in 2007 and 2008 showed that while some of the same animals that had been there before (such as tubeworms) came back, newcomer species showed up, too, including snails and limpets. The researchers’ next goal was to learn more about the oceanic flows that transport larvae. But it isn’t easy to track larvae at the bottom of the sea. They are too small to affix with acoustic tags, too small to follow around in a submarine, and too diffuse to sample. So, the team embraced a tripartite plan to measure deep-sea currents, to use computer models that would simulate larval transport in oceanic flows, and to re-enact larval dispersal in the field with the help of a special dye-like tracer. The process began with data collected by Thurnherr, who deployed current meters on the ridge to record how currents fluctuate. These data formed the basis of a computer model that Lavelle developed to simulate hydrodynamics on and around the ridges. Next, McGillicuddy, a scientist in the Applied Ocean Physics & Engineering Department at WHOI, used Lavelle’s hydrodynamic model to (virtually) “release” particles representing larvae. He ran a series of computer simulations to see where the larvae would end up. McGillicuddy embedded in his models a certain degree of what he termed “sensitivity analysis” to account for larval physiology and behavior that Mullineaux and other biologists still don’t understand. McGillicuddy can opt to change different interconnected variables every time he runs the model to analyze how various factors affect how larvae are transported. Even with these variables, the models produced some surprising results. One of the early hypotheses was that larval movements could be influenced by plumes of fluids emanating from the vents. 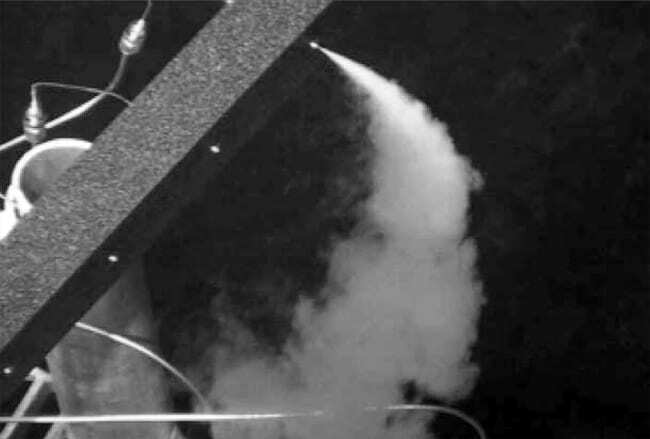 The hot plumes rise into cold seawater until they cool down and achieve what is called neutral buoyancy, then they turn and drift horizontally, much the way smoke from a smokestack does. If this hypothesis held, larvae that manage to swim a few hundred meters off the ocean floor would be the ones dispersing long distances. McGillicuddy’s models, however, suggest that precisely the opposite may be true. “According to these models, the flows are very energetic right near the bottom,” Mullineaux said. “It appears that those larvae which get into these bottom currents get advected longer distances than the ones that get up off the bottom.” Those larvae might get carried too far away from vent sites where they could resettle. Guided by these surprising findings, WHOI researchers launched the third phase of the LADDER plan: to test the model results in the field with the help of sulfur hexafluoride, or SF6, a harmless compound that scientists can track as it goes with the flows, as larvae do. For this experiment, the team turned to Jim Ledwell, another scientist in the Applied Ocean Physics & Engineering Department at WHOI and an expert on tracers. After studying McGillicuddy’s model results, Ledwell went aboard WHOI’s research vessel Atlantis to apply his expertise in the laboratory of the real world. On Nov. 12, 2006, Alvin dove down into what’s known as the “axial trough” on the East Pacific Rise—a 100-meter-wide chasm on the ridge’s summit with steep cliffs tens of meters high on each side. It extends for kilometers along the spine of the ridge. In the first experiment of its kind, a specially designed injector system on Alvin released 6.6 pounds (3 kilograms) of the SF6 along a ¾-mile (1,200-meter) section of the ridge 20 miles south of the vent site at 9o30’ N.
Would the summit trough confine the flow of water and larvae and act as a conduit between habitable vent sites? Are some larvae swept up and away from the ridge, never to find a suitable vent to settle? What other factors determine the trajectories and distances larvae can disperse from their natal vents to remote vents? Thirty-two days after the dye was released, Ledwell and company began methodically collecting water samples to find the tracer, using a sampling device called a CTD rosette, which is lowered on a wire from Atlantis. Over the next 20 days (bracketing the average 40-day larval lifespan), they sampled within the axial trough north and south of the release point. They found the tracer at the 9o50’ N site, demonstrating that larvae could make the 20-mile trip along the ridge axis within a larval lifespan. Most of the tracer, however, was found in a patch about 50 kilometers west of the ridge, though it appeared to be heading back toward the ridge. Currents moved the tracer westward, away from the ridge crest where vents form. But then, about 25 days after release, the currents swung the tracer back toward the same ridge it came from. Lavelle’s model and the tracer results, as well as theoretical work, are all in agreement that larvae could get from one vent site to another by traveling north along the western flank of the ridge. The tracer experiment also illustrated another pathway suggested earlier by MIT/WHOI Joint Program graduate student Diane Adams, working with Mullineaux. This second pathway involves eddies, or swirling currents, that may have carried the tracer or larvae away from the ridge at first, but then transported them back to the ridge. Whatever explains why the tracer did what it did, results of the test surprised Mullineaux, who for years suspected that mixing processes in the water would prevent larvae from getting back on the ridge once they veered too far off. Now, she says, the data suggest that it’s at least feasible for larvae to travel along previously unsuspected ocean pathways to colonize new sites farther along the ridge. As is usually the case, successful experiments provide answers—and even more questions, which LADDER project scientists are looking to follow up on. 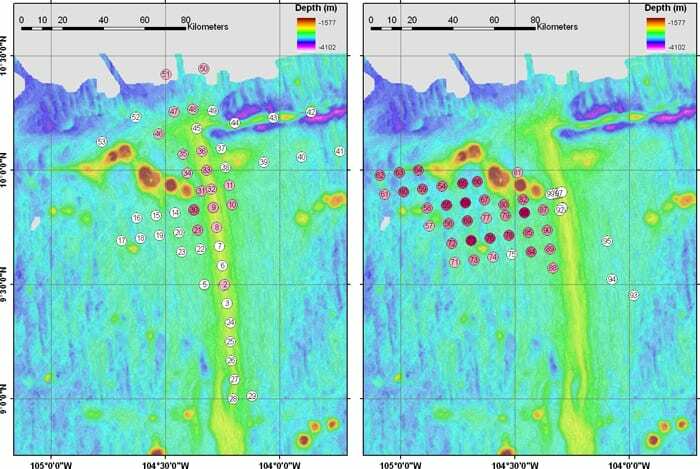 One factor they plan to closely examine is how seafloor topography influences current flows. In this case, a range of undersea mountains (or “seamounts”) northwest of the site where the eruptions occurred and the tracer was injected may have played a role in steering current patterns. The seamounts may turn flows 180 degrees, steering the flow around them and returning larvae to their native ridge, Ledwell said. Or, the seamounts could trap larvae drifting through from other places and redirect them to vent sites on the ridge. For his part, McGillicuddy has more questions about how larvae actually behave. So he will continue to incorporate a greater number of realistic larval attributes into his model to see how they influence how and where the larvae are transported. As for Mullineaux, she said she would like to further investigate the snail and limpet species that colonized the areas depopulated by seafloor eruptions but that had not been seen there before. 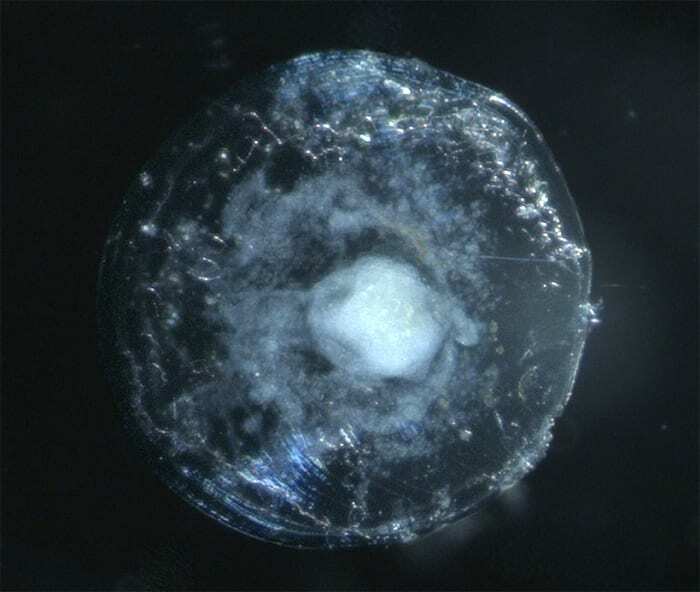 Tiny larvae of deep-sea organisms, such as this 350-micron-long larva of a deep-sea gastropod, Bathymargarites symplector, are the aquatic animal equivalent of seeds. The larvae are dispersed in the deep sea, carried by oceanic flows, and settle at vent sites where they find nutrients to grow. 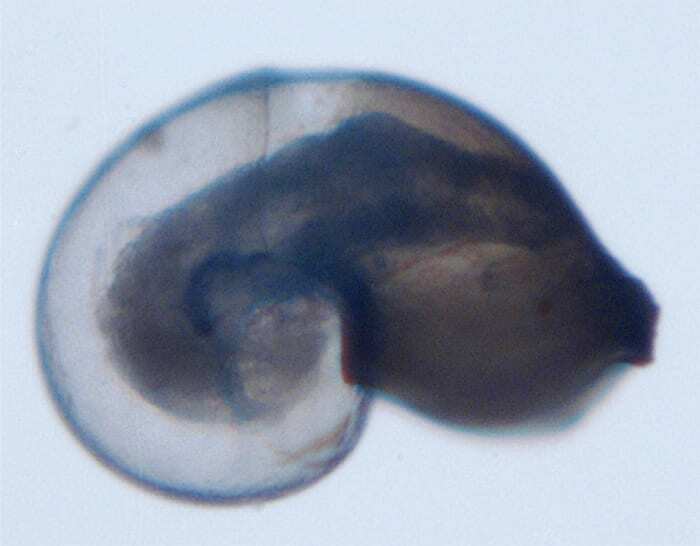 A larva of a deep-sea bivalve called Bathypecten vulcani collected on the East Pacific Rise. Its diameter is 840 microns (the width of a human hair is about 100 microns). WHOI scientist Dennis McGillicuddy used a computer model developed by NOAA scientist Bill Lavelle in a series of experiments that simulated where particles—representing larvae released at a mid-ocean ridge—would end up. In the experiment above, light blue dots represent starting points of particles released 10 meters above the ridge crest, spaced 1 kilometer apart and spanning 20 kilometers across the ridge crest. Dark blue lines indicate their pathways; red dots represent where they ended up 30 days after release.